Although the Bronx is the only one of NYC’s five boroughs attached to the mainland, it is bordered on three sides by water, as well as traversed by the Bronx and Hutchinson Rivers and dotted by lakes and ponds. It is possible to kayak along sections of the Bronx River, surrounded by trees, and feel a world away from highways, high rises, Highbridge. Conversely, walking along the Grand Concourse, the Bronx’s most famous thoroughfare, it is almost impossible to feel that water is anywhere close by. But—at 1150 Grand Concourse, right by the Housing Court and the Bronx Museum, there is a building lovingly referred to as The Fish Building. 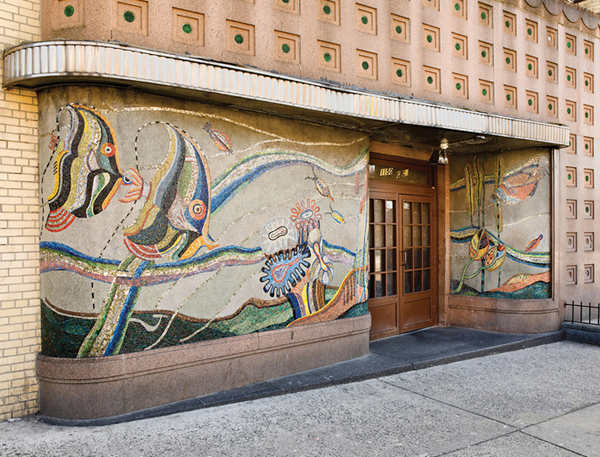 The Art Deco facade’s iridescent underwater mosaics are a striking reminder that, while the Grand Concourse is a conduit for people, buses, bikes and cars, other nearby channels are, at the very same moment, being traveled by bass, bullhead catfish, blue gills, turtles and carp. Underwater New York has been enthralled with 1150 Grand Concourse for quite some time. After discovering that the artist Gabriela Bertiller had done a community-oriented project on the building for the Bronx Museum, we were delighted to invite her to share her work on the site. Adapted from a press release on The Fish Building by Gabriela Bertiller written by Madre Buenos Aires who sponsored the project. Supported by The Bronx Museum of the Arts AIM program (Artist in the Marketplace), Argentine-born artist Gabriela Bertiller developed The Fish Building, a project that highlighted and contributed to the dialogue between the Museum and its community. The Fish Building is an Art Deco structure, appropriately named after the aquarium mosaic flanking its entrance. Bertiller, inspired by the building’s unique details and its loss of appreciation over time, transported stunning visual elements of The Fish Building into the exhibition. The artist used it as a vehicle to highlight and facilitate an exchange between the Museum and the Bronx community. During the exhibit, Gabriela honored the emblematic construction, giving it a new appreciation in a fine art setting by replicating some of the buildings interiors in the lobby of The Bronx Museum. The artist included The Fish Building’s tenants as a fundamental part of her work. The bond she proposed to stimulate materialized on the opening day when the tenants of the building formed a symbolic line in matching red t-shirts reading “Proud Tenant of The Fish Building” from The Fish Building’s entrance to the Museum Hall. This active participation of the tenants, the neighbors and museum’s visitors turned The Fish Building into not only a piece of art but a collectively constructed one. The exhibition at the Bronx Museum ran from June 26th through September 5, 2011. Gabriela Bertiller was born in Buenos Aires, Argentina, studied at Escuela Nacional de Bellas Artes Prilidiano Pueyredón and received her MFA at School of Visual Arts, New York. In 2011 she was selected for the AIM program at The Bronx Museum of the Arts. She has been artist-in-residence at Changdong Art Studio run by the National Museum of Contemporary Art in Seoul, (2005), Red Gate Gallery in Beijing (2004) and The Banff Centre in Canada (2004). Gabriela Bertiller has exhibited at The Bronx Museum of the Arts, New York, The Soap Factory, Minneapolis, Gallery Hyundai, Seoul, Hyogo Museum of Art, Japan and Centro Cultural Recoleta, Buenos Aires.